﻿ Thiago Alcântara: "Messi deserves the FIFA Balon d'Or more than Cristiano Ronado"
02.01.2012 » Thiago Alcântara: "Messi deserves the Balon d'Or more than Ronado"
We're only 1 week away from FIFA's Balon d'Or gala and despite Cristiano Ronaldo's impressive stats from last season, Lionel Messi remains being the favorite to win the award. Barcelona player, Thiago Alcântara, revealed his opinion on this issue and said that his teammate Lionel Messi deserves it more than the other 2 finalists, Xavi and Cristiano Ronaldo. Barcelona's rising star, Thiago Alcântara, is thrilled to see two of his teammates nominated for the FIFA Balon d'Or, but when the time comes to pick a single winner he sticks with Lionel Messi. Thiago believes that the Argentinian ace deserves this award more than Xavi or even Cristiano Ronaldo and confessed to be proud to be a part of this Barcelona team. The FIFA Balon d'Or 2011-2012 ceremony will take place in exactly a week, on a Monday, the 9th of January 2012. 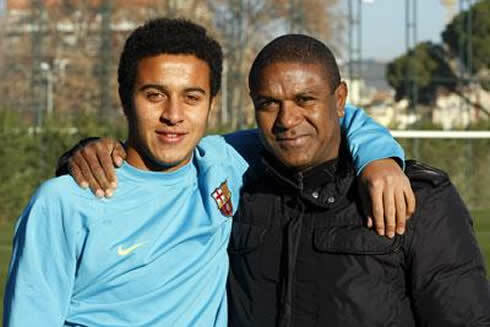 Barcelona's 20-years old midfielder, Thiago Alcântara, was born in 1991 in Italy and is the son of the former Brazilian international player, Mazinho. 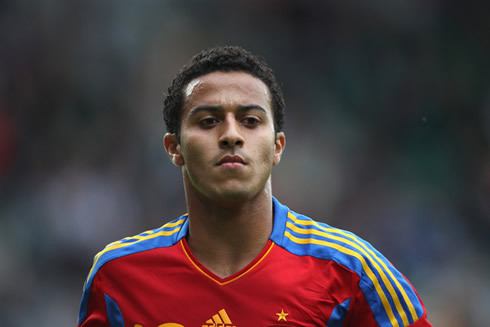 Thiago is currently one of the most promising talents in the sport and has a full Spanish citizenship, which already granted him the opportunity to represent the Spanish National Team. He started playing football in Flamengo while still in Brazil, but it has been on Barcelona where Thiago has started to draw many attentions over him, having already played 37 times for the first team, from which he scored 7 goals. Just a few months ago, he got linked with a move to Real Madrid, but it never appeared to be more than just rumors. Nearly a month ago, just after FIFA revealed who were the final 3 candidates to win the Balon d'Or, a long list of players, celebrities and managers started granting their opinion on who deserves winning this award the most. Thiago Alcântara decided to speak up as well and wasn't shy to say that Lionel Messi would be the most worthy winner, above any other of the contenders, Xavi (also his teammate at Barcelona) and Cristiano Ronaldo, Real Madrid and Portugal superstar. Thiago Alcântara: "Lionel Messi deserves this FIFA Balon d'Or, more than Xavi or Cristiano Ronaldo. It's a pleasure and a honor to play in the same team as him", said Mazinho's son to the Spanish newspaper Marca, just before approaching his own carrer expectations in the short and mid-term. Thiago Alcântara: "In 2012 I just want to keep working, learning from my teammates at Barcelona and keep developping the same way I've been doing over the past years", noted the Spanish player, who already played 21 times for Barça's 1st team this season and scored 3 goals. Barcelona's next match will be against Osasuna for the Copa del Rey, while Real Madrid will take on Malaga. If the two Spanish giants defeat their respective opponents, we're going to be presented with another two "Clasicos" in the next Spanish Cup round, by the end of January. Thiago Alcântara, who has been a regular 1st and 2nd choice in Pep Guardiola's choices, expects his team to be prepared for the upcoming challenge against Osasuna, to be held this Thursday. Thiago: "We are ready for it and we don't have any major problems. We are perfectly fit for this match against Osasuna", warned Barça's midfielder, who is likely to get some more minutes on this game. Real Madrid next match is against Malaga for the 1st leg of the Copa del Rey, in the 3rd of January 2012. You can watch Juventus live stream, Real Madrid vs Malaga, as well as Manchester City vs Liverpool and Newcastle vs Manchester United from our football live streams section. Cristiano Ronaldo is expected to be on the line-up against Malaga.